Voles, and to a lesser extent mice, are a major problem when they get going in a hosta garden. They easily reduce a huge clump to a few small divisions. They are active year round, but damage from fall to early spring is usually the worst, and they reproduce rapidly. Voles and mice can be killed with ordinary mouse traps or poisons, and each method has some reasons to be careful. When using traps cover them with a box or bucket to keep ground feeding birds and other animals away from the traps. When you use poison baits, you have to be even more careful as they contain a scent attractant that will draw a lot of animals to them. Dogs are a particular problem. The safest way to use poison baits is in large jars with a quarter size hole in the lid, or a similar feeder with a small opening. Use a block bait that they have to chew pieces off of and cannot get out of the feeder. You can protect prize plants with wire baskets, a method that works very well but is labor intensive and is difficult for large hostas. Castor oil deterrents receive mixed reviews - some say they work while others say they don't. Because voles are easy prey they prefer cover for their activities and don't like operating in the open. Cleaning up all leaves and debris and removing evergreen ground covers like pachysandra can go a long way towards reducing fall and winter damage from voles and mice. 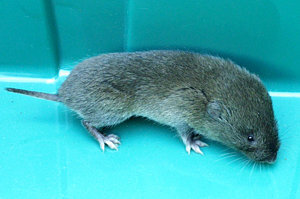 More information on vole baskets can be found HERE. In the Garden: Keep an eye out for signs, plants falling over in season and surface tunnels fall and winter. Start dealing with them quickly before their numbers build up.